Be the first to share your favorite memory, photo or story of Earline. This memorial page is dedicated for family, friends and future generations to celebrate the life of their loved one. 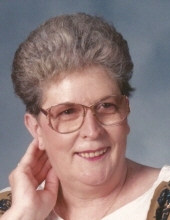 Earline E. Sanders, 76, of Camilla died Tuesday, January 29, 2019 at Archbold Memorial Hospital in Thomasville. Funeral services will be 11:00 a.m. Friday, February 1, 2019 at Parker-Bramlett Funeral Home with interment at Oakview Cemetery in Camilla. Rev. Ricky Pollock will officiate. Born October 30, 1942 in Mitchell County, Mrs. Sanders was the daughter of the late James Byron Spence Sr. and Grace Swilley Spence. She was married to the late Fred Oren Sanders. Mrs. Sanders was a sales associate with B.C. Moores and a member of First Assembly of God in Pelham. Survivors include her sons, Wayne Sanders of Camilla and Tim Sanders and wife Lucretia of Camilla; daughter, Jasmine Sanders of Tifton; grandchildren, Tyler Sanders, Brandy Johnston, Dana Davis, Steven Sanders, Holly Sanders and Hunter Sanders; several great-grandchilden. Visitation will be from 6:00-8:00 p.m., Thursday, January 31, 2019 at Parker-Bramlett Funeral Home in Camilla. "Email Address" would like to share the life celebration of Earline E. Sanders. Click on the "link" to go to share a favorite memory or leave a condolence message for the family.